It’s officially become that time of year: the days are getting noticeably longer, the skies are becoming clearer and spring/summer merchandise is starting to trickle into stores. What I seem to forget every year around this time, though, is that it’s actually still cold. I was admittedly freezing in this outfit, and probably should have opted for layers instead. After a few months of winter, though, I’m always a little too eager to pull some of my spring pieces out of hibernation. I hope I’m not the only impractical one here… do you do the same? p.s. Lots of fun things happening on the blog this week. Stay tuned! 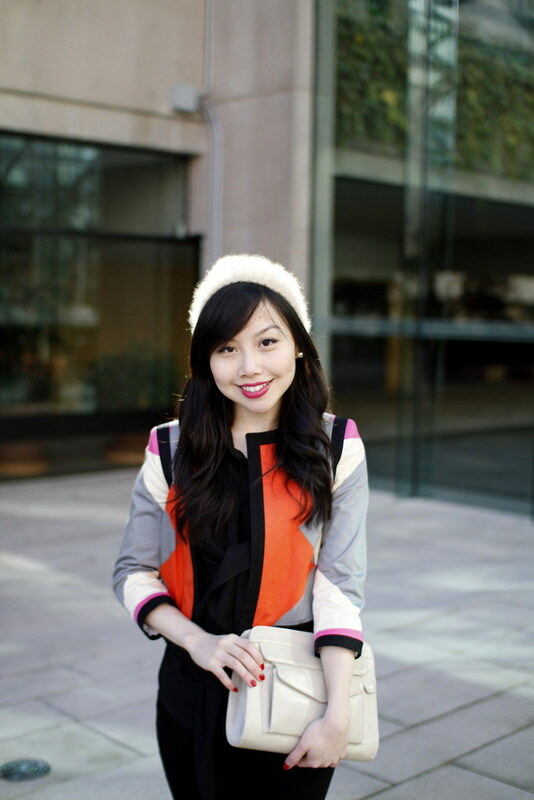 Adore the jacket, the colors are so vibrant and chic! I am SO in love with this top, Jen! In both colors! I was just at our h&m the other day and I definitely didn’t see it, but I’m majorly hoping it lands in our store as I absolutely LOVE it! Adds such a romantic, feminine flair! Also loving your jacket here! The colors are gorg! And you are not alone – I’m desperate for spring to arrive and so want to ditch boots & winter wear, but it’s still cold & we still have lots of snow! Sigh! 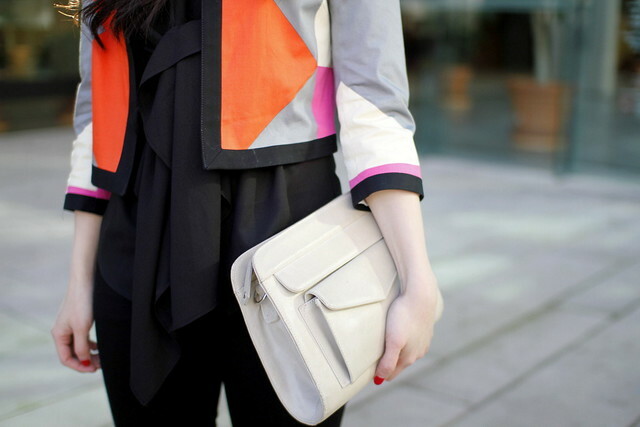 Love the bright spring colors in your jacket mixed with all the black! Very chic! I also want to take out all my warm weather clothing, and then I walk outside and it’s still freezing! Lovely jacket! I always forget how cold it actually is until I step outside as well! Love the jacket! You look great! Is this blouse a recent purchase, Jen? I love it in both black and white… no wonder you’ve been obsessed! That jacket is perfection, so chic and colorful! That colorblock jacket is so nice!! Love your outfit! Definitely pulling out spring pieces but the weather in LA allows us to do so!! Jen, you have no idea how ready I am for spring. I just dream about walking outside without having to get bundled up, and strolls along the lakeshore with a dress. Hopefully soon enough! Stunning jacket – the colours are amazing! I feel your pain. Winter is a miserable time for me, seeing as most of my outfits get swallowed underneath puffy coats and hats and ugly winter boots. We are blessed with below zero temperatures in my little hometown. I’m anxiously awaiting spring when I can prance around without a coat. Ah, you have this blouse in black too! I have yet to track it down but it’s on my to-do this weekend. I do the exact same thing as you and ditch the layers the moment I see sunshine at this time of year, which of course isn’t practical. You look gorgeous though, and your jacket is the perfect vibrant piece to bring a little Spring into this outfit. You look lovely! J’adore that print! We want to educate people that reservations are not needed and the vacancies are normal.